If your child, student or client is part of an ABA (applied behavior analysis) program then I bet you’ve heard the term “mand” used before. 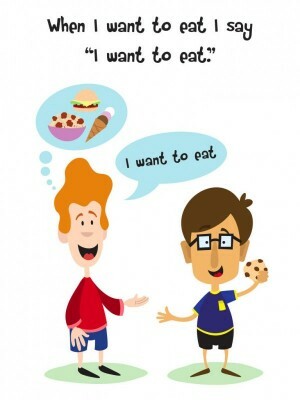 “Mand” is just a way of describing speech that is made in order to get something. So if a child says “drink” because they want something to drink, then that is called a “mand.” Many people think of mand as shorthand for “command” or “demand” as a way to remember it. This app is a “first step” for children who are not yet making requests. 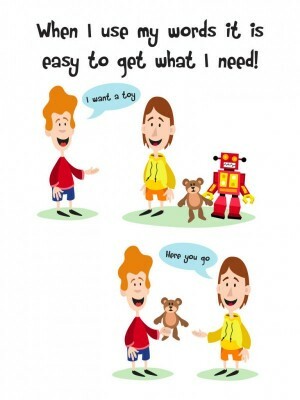 It is a very simple app to teach the beginning stages of asking for things, or “using words” to get what they need or want. It can be difficult to teach talking and other behavioral or social skills to any child and it may be especially difficult if your child, student or client is diagnosed with an autism spectrum disorder, or other intellectual disability. Visual supports, like social stories may make teaching these important skills easier and less stressful. 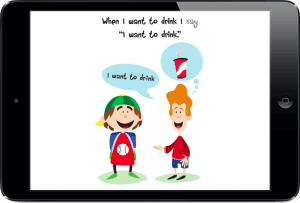 This thirteen page social story uses simple text and fun illustrations to explain why and how children can “use their words” to ask for things that they want. 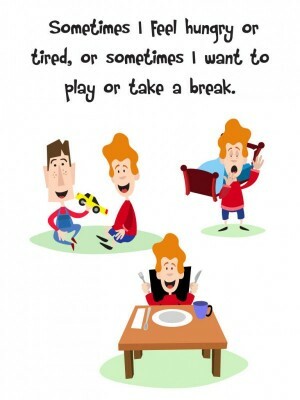 As previously mentioned many challenging behaviors may occur because your child or client is frustrated by not being able to communicate what it is that they want. 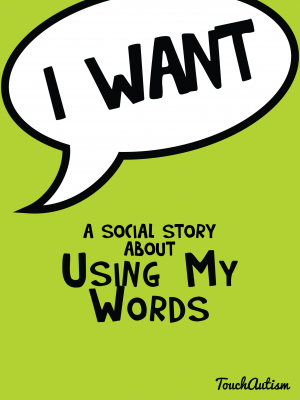 This social story reinforces the idea of “using words” instead of getting frustrated throughout it’s pages. The app also includes a chart of nine buttons that “speak” when pressed to help facilitate asking for nine different common things such as bathroom, more, a break, eat, drink, etc. This PECS style chart can help both verbal and non-verbal children learn to “ask” for what they want. The chart can be used with verbal children as a visual prompt. The appropriate button on the chart can be pointed to, to prompt the child to ask for what the picture represents. Physical prompts like pointing can be easier to fade out than verbal prompts. 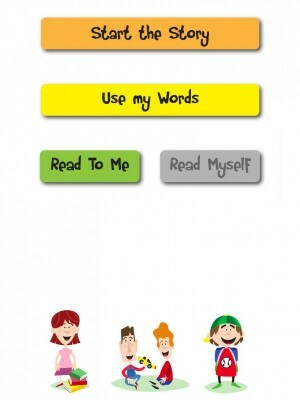 The button can even be pressed to say the request, and then repeated by the child. This can then be faded by turning the sound off and touching the button to prompt the child to verbally make the request on their own. Once this step is mastered the prompt can be faded to simply pointing to the button, and then gradually the pointing finger can be moved farther and farther away from the button until the whole chart is being gestured to. The chart can also be used with non-verbal children with the goal being that they eventually use it independently. 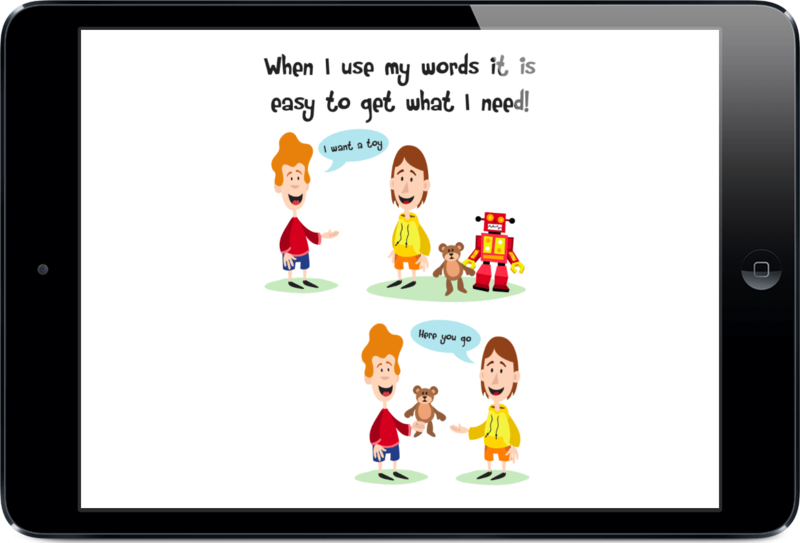 To fade prompting for non-verbal children you can use hand-over-hand to have them push the appropriate button for a request. The request through the app must be immediately reinforced with whatever was asked for. The “hand-over-hand” prompt can then be faded by moving your hand farther and farther away from the child’s hand, eventually teaching them to open the app independently to use the chart to make simple requests.